Fleetwoods Butchers in Gorleston-on-Sea near Great Yarmouth sell quality cuts of meat, speciality sausages, deli items, pies and pates, sauces, condiments and ready meals. From Great Yarmouth follow signs for Gorleston-on-Sea. 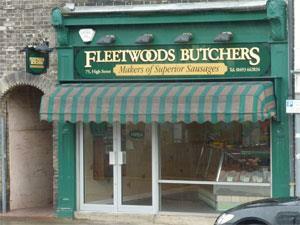 Fleetwoods Butchers is located mid-way along the main High Street.